Learning with LEGO is so much fun and so easy to do. We have been using our LEGO for some simple Earth Science activities this Spring. 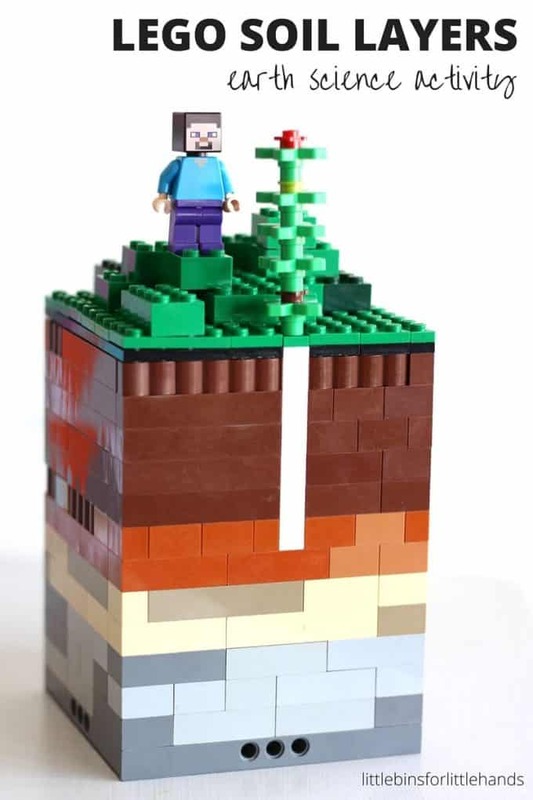 Learn about and build a slice of the Earth with a LEGO LAYERS OF THE EARTH activity or build a LEGO SOIL LAYERS MODEL! Use your basic brick collection for hands on learning. Print out these free LEGO Earth Coloring Pages and LEGO Earth Day Coloring Sheets to go along with the fun! LEGO EARTH COLORING PAGES FOR KIDS! Build cool LEGO models for Earth science and use our free printable coloring pages to go along with your lesson. 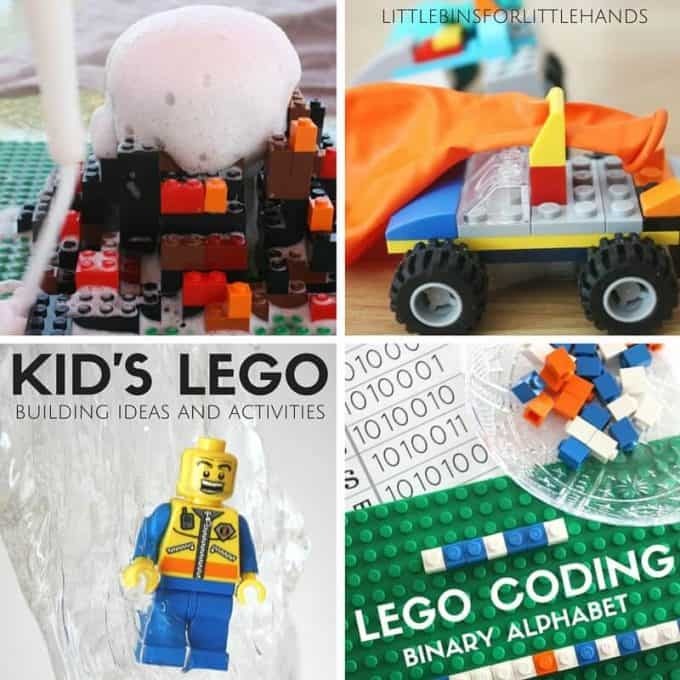 We had a great time talking about, building, and coloring in these LEGO ideas. Plus if Earth Day is right around the corner, these Earth coloring pages make an easy Earth Day activity. Of course it should be Earth Day every day! 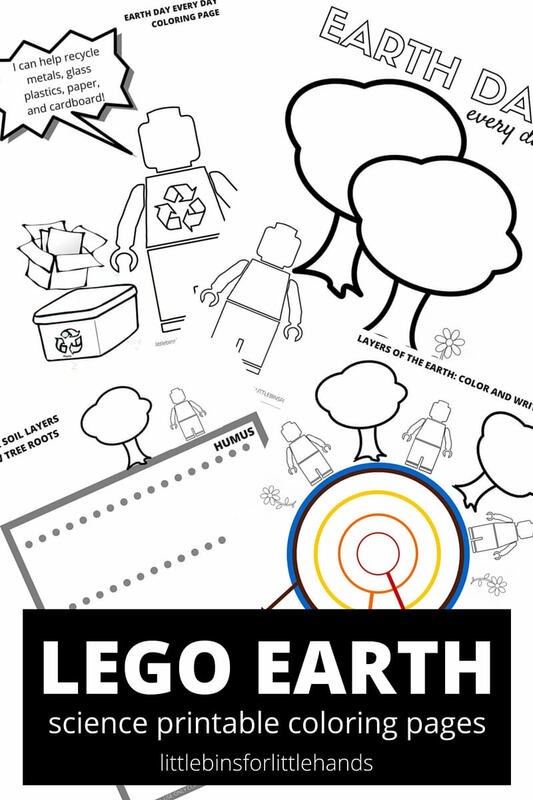 There are 4 LEGO Earth Coloring Pages to print! The first three pictured here are available by clicking the the DOWNLOAD HERE link below. They include the Layers of The Earth page, the Soil Layers page, and the Earth Day Every Day page. 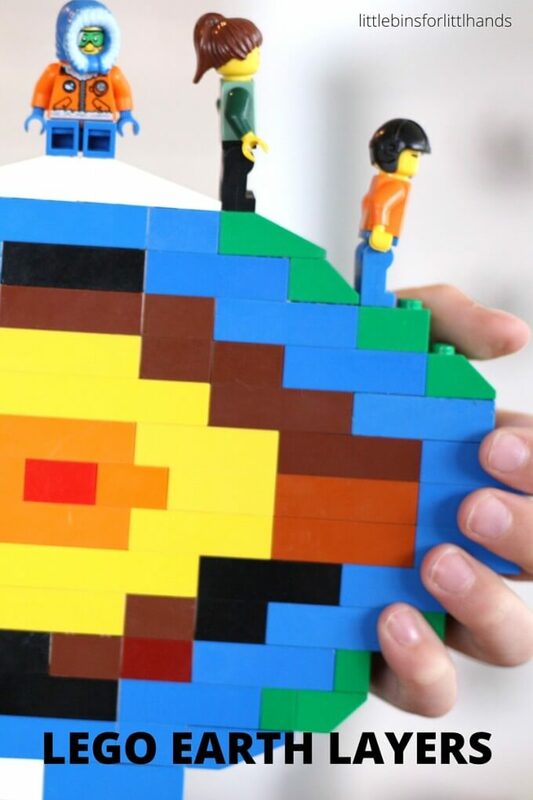 Use this sheet with this LEGO Layers of The Earth Activity. Print in either color or black and white. 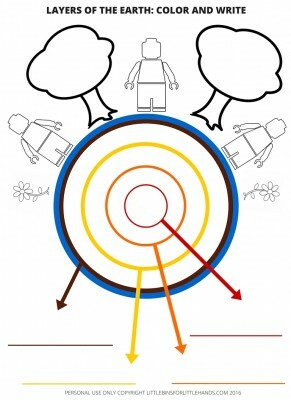 Color and identify the layers of the Earth and write the words on the lines provided. 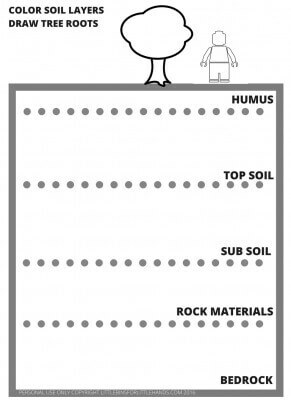 Use this Earth coloring page with our LEGO Soil Layers Model! Color the layers and draw the roots of the tree! 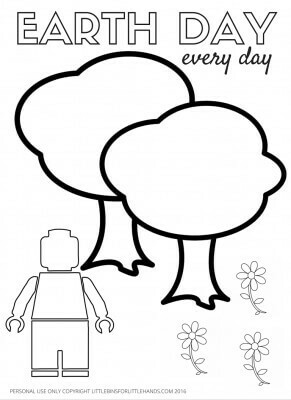 Here’s a simple LEGO coloring page for Earth Day! Color your favorite LEGO mini-figure! 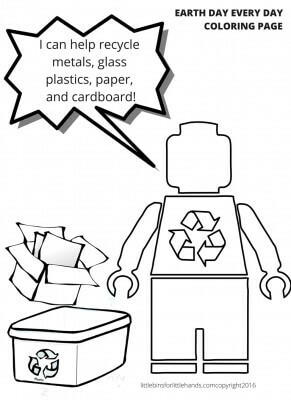 Get your LEGO Coloring Page about recycling by clicking on DOWNLOAD HERE link above. Check out your own recycling station or set one up if you don’t have one! Kids can really help with household recycling and makes a great chore for younger kids. Color the sheet and draw in your own recyclable items! 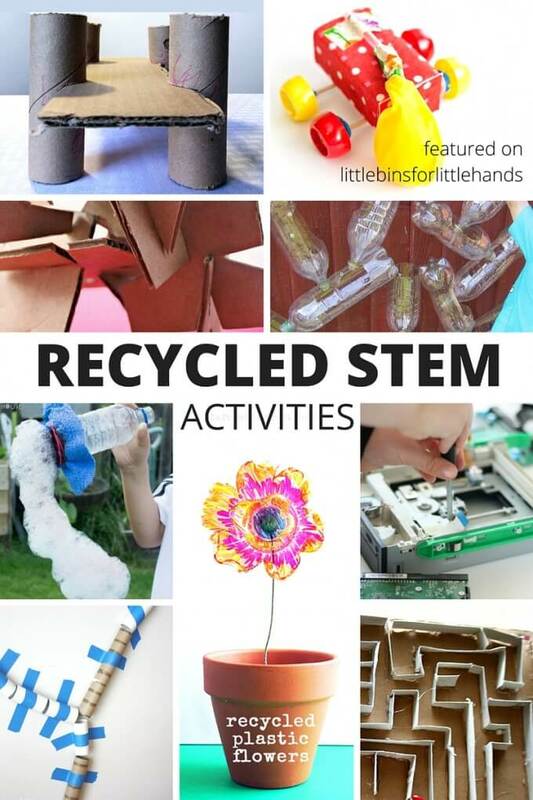 Click on the image below or on the link for fun STEM projects for kids using recyclables. LEGO COLORING PAGES FOR EARTH SCIENCE FUN! Click on the image below or on the link for more LEGO activities.